Brand your admin site with your corporate colours. Click Admin and then 'Name & Themes'. You can select three colours: i) for your top navigation background, ii) for the secondary navigation background and iii) is for the text colour as well as the background for the left hand column. The best way to get an accurate colour is to get the HEX code for your corporate colours from your graphic designer and you can then enter that in the colour picker. You can preview and then press save. Once saved, it will apply that corporate colour theme for all your team users. 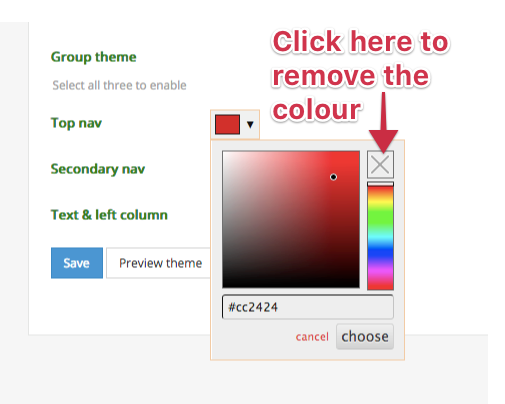 If you decide to remove the theme then just select 'no colour' - the top right hand option in one of the colour pickers. And then press save. This will remove all the colour themes (you need to use all three to enable the theme).